Laura Nyro (born Laura Nigro) (October 18, 1947 – April 8, 1997) was an American composer, lyricist, singer and pianist. Her style was a distinctive hybrid of Brill Building-style New York pop, mixed with elements of jazz, gospel, rhythm and blues, show tunes and rock. She was best known, and had the most commercial success, as a composer and lyricist rather than as a performer. Between 1968 and 1970 a number of other singers had significant hits with her songs: the Fifth Dimension with "Blowing Away", "Wedding Bell Blues", "Stoned Soul Picnic", "Sweet Blindness", "Save The Country" and "Black Patch"; Blood, Sweat & Tears and Peter, Paul & Mary with "And When I Die"; Three Dog Night with "Eli's Coming"; and Barbra Streisand with "Stoney End". "Time and Love", and "Hands off the Man (Flim Flam Man)". Ironically, Nyro's best-selling single was her recording of Carole King and Gerry Goffin's "Up on the Roof". While in high school, she sang with a group of friends in subway stations and on street corners. She said "I would go out singing, as a teenager, to a party or out on the street, because there were harmony groups there, and that was one of the joys of my youth. Among her favourite musicians were John Coltrane, Nina Simone, Pete Seeger, Curtis Mayfield, Van Morrison, and girl groups such as Martha and the Vandellas and the Shirelles. She also commented: "I was always interested in the social consciousness of certain songs. My mother and grandfather were progressive thinkers, so I felt at home in the peace movement and the women's movement, and that has influenced my music." Her father’s work brought him into contact with record company executive Artie Mogull (1927-2004), who auditioned Laura in 1966 and became her first manager. As a teenager she experimented with using different names, and Nyro (which she pronounced "Nero") was the one she was using at the time. She sold her song, "And When I Die", to Peter, Paul and Mary for $5,000, and made her first extended professional appearance, at age 18, singing at the "hungry i" coffeehouse in San Francisco. Mogull negotiated her a recording contract, and she recorded her debut album, More Than a New Discovery, for the Verve Folkways label. The album provided material for other artists, notably the Fifth Dimension. Soon afterwards, David Geffen approached Mogull about taking over as her agent. Nyro successfully sued to void her management and recording contracts on the grounds that she had entered into them while still a minor. Geffen became her manager, and the two established a publishing company, Tuna Fish Music, under which the proceeds from her future compositions would be divided equally between them. Geffen also arranged Nyro’s new recording contract with Clive Davis at Columbia Records, and purchased the publishing rights to her early compositions. Around this time Nyro considered becoming lead singer for Blood, Sweat & Tears, after the departure of founder Al Kooper, but was dissuaded by Geffen. However, BS&T would go on to have a hit with a cover of her song "And When I Die." The new contract allowed Nyro more artistic freedom and control. In 1968 Columbia Records released her second album, Eli and the Thirteenth Confession. This received high critical praise for the depth and sophistication of the performance and arrangements, merging pop structure with inspired imagery, rich vocals and avant-garde jazz, and is widely considered to be one of her best works. It was followed in 1969 New York Tendaberry, another highly acclaimed work which cemented Nyro’s artistic credibility. The record's "Time and Love" and "Save the Country" emerged as two of her most well-regarded and popular songs. Her fourth album, Christmas and the Beads of Sweat, was issued at the end of 1970. The set contained such well-known Nyro diamonds as "Upstairs By a Chinese Lamp" and "When I Was a Freeport". It featured Muscle Shoals musicians including Duane Allman. The following year’s Gonna Take a Miracle was an album of her favourite "teenage heartbeat songs", recorded with vocal group Labelle (Patti Labelle, Nona Hendryx and Sarah Dash) and the production team of Kenny Gamble and Leon Huff. With the exception of her attribution of the song "Désiree" (originally "Deserie" by The Charts), this was Nyro's sole album of wholly non-original material, featuring such songs as "Jimmy Mack", "Nowhere to Run", and "Spanish Harlem". By this time, Nyro was married, to carpenter David Bianchini in 1971. She was also reportedly uncomfortable with attempts to market her as a celebrity, and she announced her retirement from the music business at the age of 24. The initial Verve debut album was acquired and reissued by Columbia as The First Songs. By 1976, her marriage had ended, and she returned with an album of new material, Smile. She then embarked on a four-month tour with a full band, which resulted in the 1977 live album Season of Lights. Having met initially in 1967, Laura in 1980 re-united with her eventual life partner, painter Maria Desiderio (d. 1999). After the 1978 album Nested, recorded when she was pregnant with her only child, she again took a break from recording, this time until 1984's Mother's Spiritual. She began touring with a band in 1988, her first concert appearances in ten years. The tour was dedicated to the animal rights movement. The shows led to her 1989 release, Laura Nyro: Live at the Bottom Line, which included six new compositions. Her final album of predominantly original material was Walk the Dog and Light the Light (1993), her last album for Columbia, which was co-produced by Gary Katz, best known for his work with Steely Dan. This sparked reappraisal of her place in popular music, and new commercial offers began to appear. She reportedly turned down some lucrative film-composing offers, although she did contribute a rare protest song to the Academy Award winning documentary "Broken Rainbow", about the unjust relocation of the Navajo people. Also according to sources, both "The Tonight Show" and "The David Letterman Show" staff heavily pursued Nyro for a TV appearance during this period, yet she turned them down as well, citing her discomfort with appearing on television (she only made a handful of early TV appearances and one fleeting moment on VH-1 performing the title song from “Broken Rainbow” on Earth Day in 1990). She never released an official video, although there was talk of filming some "Bottom Line" appearances in the 1990s. In 1996 she was diagnosed with ovarian cancer. After the diagnosis, Columbia Records prepared a double-disc CD retrospective of material from her years at the label. The company involved Nyro herself, who selected the tracks and approved the final project. She lived to see the release of Stoned Soul Picnic: The Best of Laura Nyro (1997), and was reportedly pleased with the outcome. Nyro died of ovarian cancer in Danbury, Connecticut on April 8, 1997, at the age of 49. The same disease had claimed the life of her mother at the same age. Posthumous releases include Live From Mountain Stage (recorded 1990), Angel in the Dark (2001), which include her final studio recordings made in 1994 and 1995, and Live: The Loom's Desire, a set of live recordings with solo piano and harmony singers from The Bottom Line Christmas shows of 1993 and 1994. A tribute album, "Time and Love: The Music of Laura Nyro", on which Nyro's compositions were performed by fourteen women singers and groups, including Phoebe Snow, Suzanne Vega, Roseanne Cash, Sweet Honey in the Rock, Lisa Germano and Jane Siberry was issued in 1997 after her death. 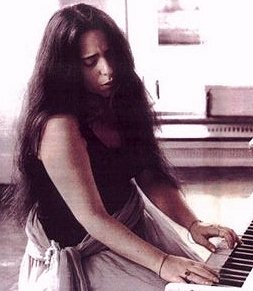 Siberry's contribution to the project was a medley of Nyro songs called "When I Think Of Laura Nyro", which would subsequently appear on her own compilation "City". Nyro's influence on popular musicians has also been acknowledged by such artists as Joni Mitchell, Rickie Lee Jones, Steely Dan and Todd Rundgren. Rundgren stated that, once he heard her, he "stopped writing songs like The Who and started writing songs like Laura". His song about her, "Baby, Let's Swing" on his first solo album "Runt", includes the lyrics "Laura...I saw you open in L. A." and "Now I love to shuffle / ever since I heard you sing". * Jenny Lewis of Rilo Kiley, when promoting her 2006 solo album "Rabbit Fur Coat" repeatedly cited Nyro's 1971 album "Gonna Take a Miracle" as a big influence on her music. * Bob Dylan reportedly startled a young Laura Nyro when he approached her at a party and declared "I love your chords!" * Diane Paulus and Bruce Buschel co-created "Eli's Comin", a musical revue of the songs of Laura Nyro. Anika Noni Rose starred. * Alice Cooper has mentioned that Nyro is one of his favorite songwriters on his syndicated radio show. * Her songs were also recorded by artists as diverse as Carmen McRae, Junior Walker, Chet Atkins, Frank Sinatra, and Swing Out Sister. * The Alvin Ailey Dance Company and the Canadian Ballet have also included her music in their performances. * On her 2006 album "Build a Bridge," the operatic/Broadway soprano Audra McDonald included covers of Laura Nyro's songs "To a Child" and "Tom Cat Goodbye." * Nyro's "Save the Country" was sampled on Kanye West's song "The Glory," on his 2007 album Graduation. * On October 2, 2007, three time Tony nominee Judy Kuhn released her new album "Serious Playground: The Songs of Laura Nyro". The album, which debuted as a concert to a sold out house at Lincoln Center's American Songbook Series in January 2007, includes several of Nyro's biggest hits ("Stoned Soul Picnic", "Stoney End") as well as some of her lesser known gems. A biography of Nyro, "Soul Picnic: The Music and Passion of Laura Nyro", written by Michele Kort, was published in 2002 by Thomas Dunne Books/St. Martin's Press. Laura Nyro's music was the subject of an in-depth 2003 study by music theorist Ari Lauren at the University of Chicago. By analyzing the rhythmic and chordal progressions of Nyro's early work, Lauren elucidated the similarities between Nyro's songs and the compositions of the Tin Pan Alley era, arguing that Laura Nyro deserves a place within the pantheon of the Great American Songbook, alongside such composers as George Gershwin, Harold Arlen, and Jerome Kern. Nyro's life and music were celebrated in a 2005 BBC Radio 2 documentary, "Shooting Star – Laura Nyro Remembered", which was narrated by her friend Bette Midler and included contributions from her one-time manager David Geffen, co-producers Arif Mardin and Gary Katz, and performers Suzanne Vega and Janis Ian. It was rebroadcast on April 4, 2006. Comedian, writer, and singer Sandra Bernhard has spoken extensively of Laura Nyro as an ongoing inspiration. She dedicated a song to her on "Excuses for Bad Behavior (Part One)". She also sang Nyro's "I Never Meant to Hurt You" in her film "Without You I'm Nothing". Nyro had a long term relationship with singer/songwriter Jackson Browne. The song "That Girl Could Sing", found on Browne's album "Hold Out", is about Laura Nyro.